The setting is the small rural towns and villages around Colchester in 1980s Essex, and brings us a well-earned reintroduction us to DI Nick Lowry, following his first outing in ‘Blackwater. We also get to meet DC Dan Kenton and WPC Jane Gabriel. Our detectives are called to Fox Farm and the apparent suicide of TV historian Christopher Cliff. It appears that a Shotgun was involved however the waters are muddied by the discovery of a second body on the railway line adjoining the farm. Intially the deaths seem unrelated, but the tangled relationships of the dead men appear intertwined. Lowry will need all of his dogged (and sometimes unconventional) skills to untangle and disassemble a veritable Gordian Knot of lies, assertions and half-truths that are presented to him and his team. Then there is Cliff’s wife, who has a somewhat tenuous grasp on la vérité; an antiques dealer with a history of playing fast and loose with the law. Lowry and his team are further hampered by Lowry’s boss, who heads up Colchester Police Station and the Chief Constable, who was at university with Cliff and just happens to be Jane Gabriel’s aunt. 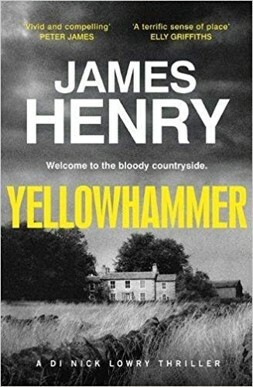 The rural setting and lack of modern day technology and techniques give the narrative a realistic feel to the grind of a police investigation. However, the author adds vignettes and a welcome depth into our trio of police officers, succeeding in fleshing them out with life and dimension. This intricately crafted piece of nostalgia has a smorgasbord of touchstone moments for readers of a certain age, evoking both the time and place thoughtfully (and with aplomb). There is some casual sexism and racism voiced, which (as I served on a rural force at about this time), can confirm its validity in the narrative, which reflected those days and the “canteen culture”. Nevertheless, this is a deftly plotted tale, with some nice twists and turns along the way. The setting and pace give a generous nod to ‘The Golden Age’, with bereaved and otherwise relatives, neighbours with a secret and dodgy businessmen, coming together in this dark and involving tale. A thoroughly enjoyable sliver of retro-noir.